It's Saturday! Normally I don't post on Saturdays, but I have so much fabulous stuff in the queue and I only have one full week until Digit-al Dozen Week. So I need to get crack-a-lackin'! Today I have a herringbone mani done with a few shades from the China Glaze Autumn Nights Collection. This Fall Collection consists of 12 really luxurious shades. I love so many of these on their own...but I also love how the entire collection works together. Which is why I was inspired to combine a few favorites into some nail art. The three polishes I chose can all pass for one-coaters, which makes them perfect for this technique. I started with a base of Red-y & Willing, a gorgeous, ultra shimmery burgundy red. I used a single coat of Seche Vite at this point because I knew there were several layers of polish to come and I wanted the base to be dry. Then, using the simple herringbone technique, I alternated Red-y & Willing along with Gossip over Gimlets, a silvery foil, and Goldie but Goodie, a bronzy, glittery shimmer. Here's a rare "in-process" shot. 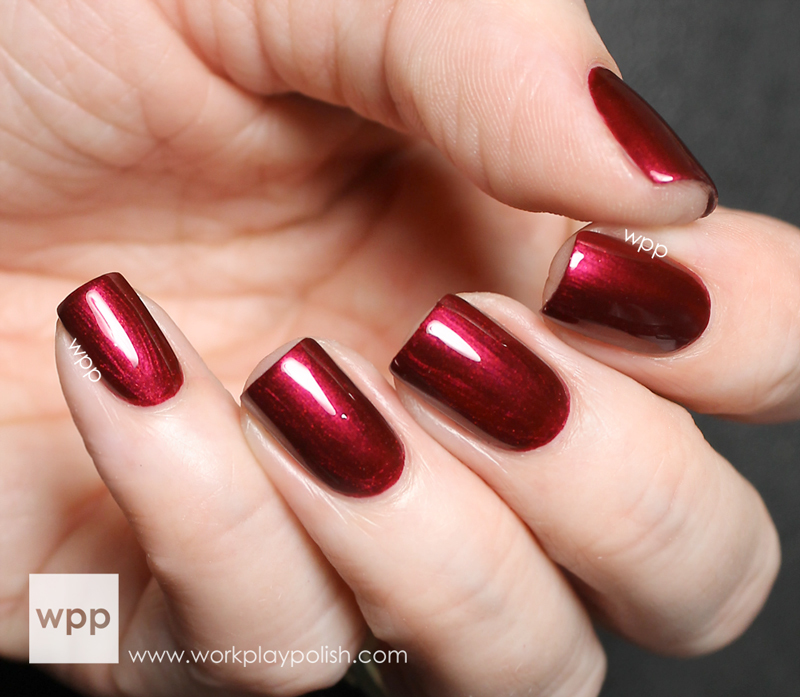 As you can see, polish will get on your skin as you swipe the diagonal lines using the wide polish brush. But no worries. I waited to the end to clean up. I finished with another coat of Sece Vite to make everything smooth.